They say it's a war against terrorism. And sometimes the mouth where the word "terrorism" is formed is in a trusted face, perhaps even a smiling face. And one guesses that many of those faces belong to people who truly believe what they are communicating, since we all know there are terrorists, who deliberately target the innocent to heighten the visibility of their cause. But there's a larger picture of the war on terrorism emerging as this policy of preventive and pervasive war in the U.S. rolls on. Increasingly we need to ask, "War on WHOM?" During the Vietnam war there was a wonderful poster hanging in my office. It read, "Foreign Policy Eventually Comes Home." 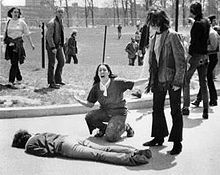 It was a picture of police beating war protestors with the dead at Kent State in the background. Today our war policies in the U.S. are bringing this truth home with a vengeance. And like in Vietnam, the first to feel the brutality are the young. Our kids aren't safe! The war has come home! A heightened climate of fear and the profits from weapons fuels a larger and larger fire. The arms industries are so powerful, we're invested in them so heavily, they call the shots in the Senate, on our streets and in our schools. Although the great majority of NRA members approve of background checks, as does the citizenry, the industry lobby does not. So we continue to see the likes of Newtown where school children and teachers were massacred, most recently in the aborted attempt in a Georgia school and the killing of the Australian runner shot by three bored teenagers. There have been more than 21,000 Americans who have died from guns since those 26, nine months ago, at that Connecticut school. Remember the infant, shot by his mother in January in Florida? How about the 16 year old killed while playing with his younger brother in Florida in February? Or the 3 year old in Michigan who shot himself with his dad's gun in March? Or the 4 year old who shot a woman in April at a family cookout in Tennessee? Or what about the 2 year old killed by her 5 year old brother in Kentucky in May? Did you read about the 12 year old in Ohio who shot his younger brother in the head then killed himself, in June? Or the 8 year old in California killed when her apartment was sprayed with gunfire in July? How about the 2 year old killed this month by his grandfather in Georgia? We're killing our children, literally, as our policy of preventive and perpetual war comes home. But we're killing our kids in other ways as well. Instead of developing strong minds and bodies in stronger public education, we nickel and dime our educational system, pay teachers poorly, provide little infrastructure support for children in need, and then blame the system if there's less than excellent performance. In the meantime, the Obama administration submits a 2013 budget request where 57% of our national resources will go to the military, including nuclear weapons programs, with 6% for education. And you know, some in our Congress don't like that 6%, and educators don't like what some of it supports. But the national budget simply reflects national priorities. As President Eisenhower said as he left office, five star general that he was, "Every gun that is made, every warship launched, every rocket fired, signifies in the final sense a theft from those who hunger and are not fed, those who are cold and are not clothed." Those war priorities also get played out in states and localities. Our South Dakota Governor goes to the Mall of America wooing "development" away from Minnesota (we have an economic, how should I say this … is it a war or just friendly competition?) with our neighbor to the East. And how much will these new industries wooed to come here pay to help fund education in the state? And who gets a special invitation to locate in South Dakota? Answer - arms manufacturers from the state of Connecticut unhappy with sensible legislation passed there in the wake of the killings in Newtown. I haven't heard how many South Dakota schools the Governor has wooed or visited recently, many I hope. I have a long list of ways the war on terrorism is coming home, too many for this short space. But let me name a few, because we're all potential terrorists! And the definition of terrorism, especially according to security agencies and authorities, grows with each passing day. Now it's whistleblowers! Although he avoided the worst of the charges against him, Bradley (Chelsea) Manning is off to prison for an act of conscience and a legal duty, according to international conventions, to reveal war crimes. He's not the first, nor will he be the last. The rights of citizens to know the actions of their government are disappearing in the climate of fear and the burgeoning development of "national security systems." And journalists! Now we have intelligence agencies in England trying to intimidate journalists and their loved ones and destroying property of their paper in concert with U.S. interests. Most media outlets in our country have already been intimidated to the point of silence, where we seldom if ever get the truth about what's really happening. Who remembers investigative reporting? There is also a war: on the poor, on voters (certain kinds), on objectors to certain policies favorable to big corporations like Keystone XL, on immigrants (really, "give me your tired, your poor? "), on small farmers, on women and their rights, on folks who want to know what's in their food, and on those pesky young people who had the gall to say "we're the 99%." And our privacy? 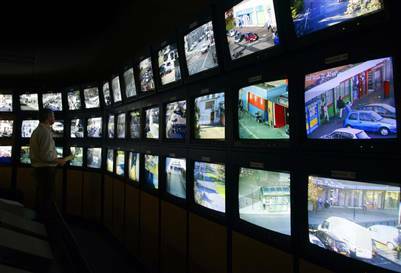 The revelations about NSA surveillance are not all out there yet, but it's coming. Just know that big brother is watching, because we are all "suspects," and will be till proven otherwise, I suppose when we are buried and in our grave!